VW Camper. Picture by Colin Rennie. Only a handful of cars have ever managed to be considered both cute and cool at the same time. Fewer still manage to command that status more than five decades later, making them highly sought-after collector’s pieces for motoring enthusiasts around the world. 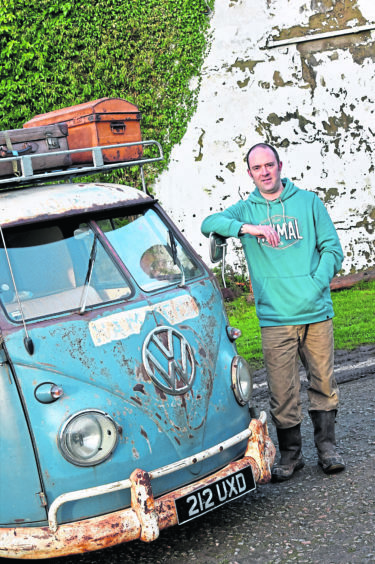 But Volkswagen’s original camper van has been firmly in this category for some time, and Mintlaw resident Geoff Morrison has been an admirer for as long as he can remember. 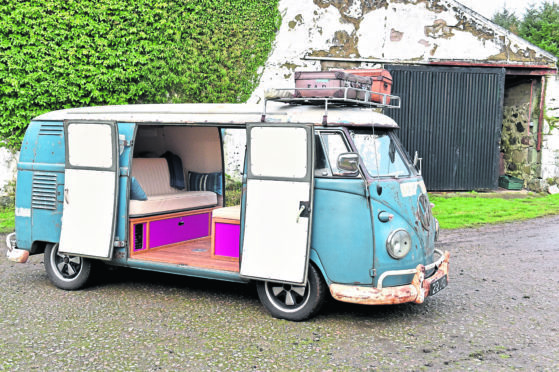 Originally designed for cheap family holidays and transporting goods, the cute VW camper soon inadvertently became an adored symbol of the 1960s Hippie movement. Their sunny colours and shiny chrome bumpers were synonymous with a rebellious way of life, and even today remain a ubiquitous feature of the summer festival season. But it wasn’t a camper that Geoff, 47, originally had his eye on. “I first came across Volkswagen when I picked up a magazine called VolksWorld in John Menzies as a teenager,” he said. “It was issue number two and I was very taken with the Beetle. “A couple of years later I turned 18 and was looking for my first car – I was desperate for it to be a Beetle. Obviously at that age it needed to be inexpensive so when I saw one for sale down in Leeds my dad and I went down with a trailer to take a look. “I couldn’t leave without it of course, but when I got it back home I realised it was in much worse condition that I thought. I worked away on it in the garage though and eventually got it on the road. Today, Geoff’s pride and joy is an original light blue 1960 VW camper, which he shipped over from the States in 2002. “It came from a scrapyard in Arizona where it had been just sitting in the desert,” he said. “Remarkably, all the important parts were pretty much rust-free, and it even had the original metal panels. “I rewired it, updated the suspension and brakes and it was pretty much good to go. But at some point it had been painted white by a previous owner, and one day I leant against it while it was wet and the paint came right off. “Underneath it revealed a logo which said ‘Thomas Gogan & Sons’ which I researched and eventually tracked down to a Texas musical instrument dealer in the 1960s. “It turned out that Thomas Gogan was Irish and born in about 1890. “When he got on the boat to America there is a lovely little story of him taking as many musical instruments as he could carry across. 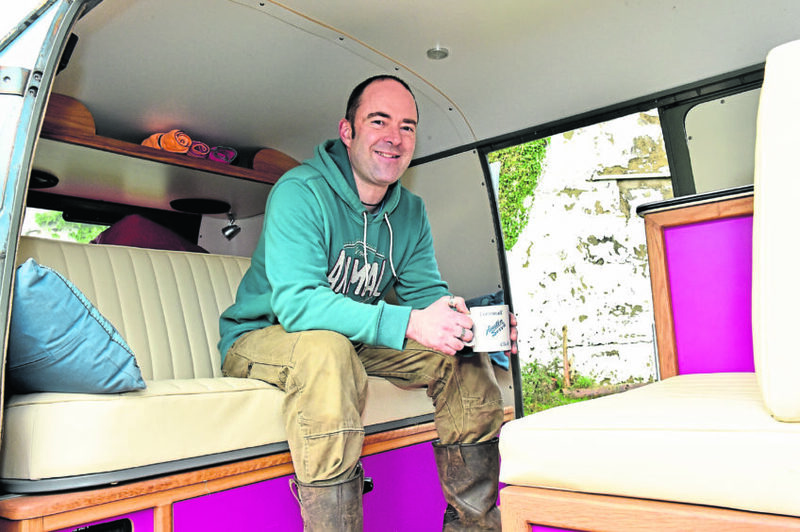 As well his beloved camper – which has recently been kitted out with a new interior – Geoff also has a classic Austin Seven Pearl Mark II, a 1959 Ford Popular 100e and a 1980s MK2 Golf GTI. For a time he had even more wheels on his driveway, as he used to run a small business hiring out VW campers. “I had customers who had only ever driven modern cars yet they got in a 1970s vehicle with no issues,” he said. “Then there were others who really struggled. 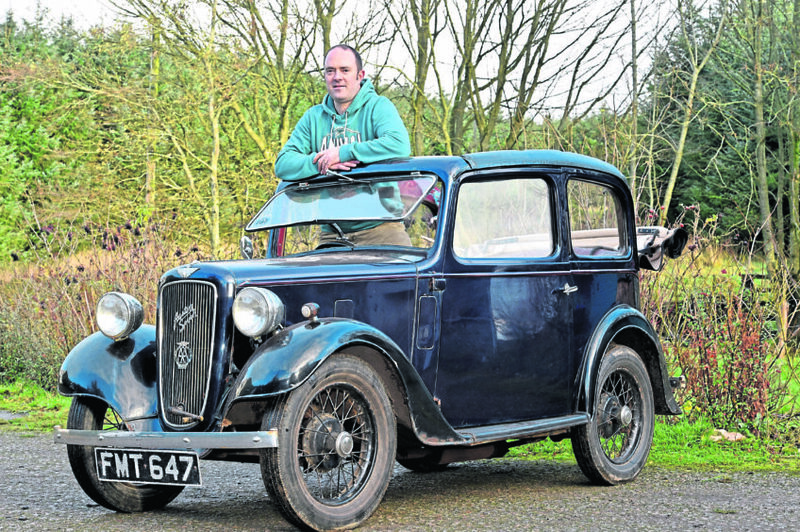 Geoff Morrison with his Austin 7. After selling the business (and the additional campers along with it), Geoff found a new role as an LPG gas tester – but ensured he was never far from his beloved Volkswagens. “When I hired out the campers I constantly needed to employ someone who was qualified to safety check the gas cookers,” he said. “I got chatting to the guy who did it and it turned out he was retiring, so I did some training and took over from him recently. “For me I enjoy the mechanics of all the different bits and pieces as much as I do the driving. And it’s true, because perhaps of all the four-wheeled motors ever made, the Volkswagen camper can evoke a feeling of sentimentality like nothing else. Not only is it a symbol of the 60s motoring era, but the mere memory of it can make people who never had one and never even rode in one sentimental. Forget cute, this might just be one of the most iconic motors ever made.